Are you a local business looking for a new way to get in front of potential customers? Are you a locally-owned business or professional service having trouble competing with the big box stores and “chain” companies? Do you find it hard to get your information directly into the hands of potential customers, especially in fast-growing communities where new neighborhoods are popping up almost weekly? Are you committed to your community, wanting to be more than just another nameless, faceless business? You’re exactly who we’re looking for! We’re eager to introduce your business to New Residents who are moving in. And we want to do it in a unique, old-fashioned way. Housewarmers affiliate owners are hands-on folks who are active in the community. They are passionate about making Newcomers feel welcome and connected. Housewarmers are in business to make a difference, and that is worthwhile for every Sponsor. Let us promote your business with a proven track record of success as an effective means of advertising. Our gift bag brings together a collection of local businesses and services eager to greet new residents. The US Postal Service calls the weeks following a move the “hyper-spend” period, when New Residents spend an average of $7,100 on relocation-related goods. That includes everything from new furniture to take-out food. Many of these folks have to establish new business relationships on everything from a dentist to a dog-groomer. If they are new to the area, then finding out who to trust can be difficult. It’s a golden opportunity if you know how to reach them. That’s where Housewarmers comes in! 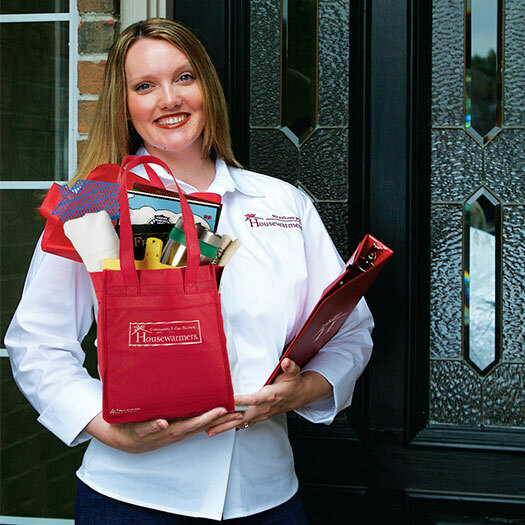 When a Housewarmers Greeter hands over a red welcome bag, it’s with the assurance that the businesses represented inside are recommended. You’ll know that we’re proud to represent you. Furthermore, our “Preferred Business” status means each category is industry-exclusive. We will only have one representative of each business in our Housewarmers bag. We are only recommending YOU! That means you reach new residents ahead of your competition! Learn more about becoming a Housewarmers Gift Bag Sponsor! Call us at 903.456.2257, or fill out our convenient online form and we’ll respond right away. Whether you are looking for a community that Housewarmers currently serves or looking for an open community. Fill out our short form and we will put you in contact with the closest community that Housewarmers serves! Want a Housewarmers welcome gift bag? Let us know and we will get you one as soon as possible!